High Yield Debt is the one-stop resource for wealth advisors seeking an in-depth understanding of this misunderstood asset class. The high yield market provides a diverse opportunity set, including fixed and floating rate debt, high and low quality debt issues and both short- and long-term duration; but many fail to understand that not all high yield exposure is the same, and that different market segments and strategies work best at different points in the economic cycle. This guide addresses the confusion surrounding high yield debt. You'll find the information you need to decide whether or not to buy in to a high yield fund, and how to evaluate the opportunities and risks without getting lost in the jargon. The U.S. corporate high yield market is worth $2.4 trillion—more than the stock markets of most developed countries. Market growth has increased the number of funds with high yield exposure, as well as the types of debt products available for investment. This book breaks it down into concrete terms, providing the answers advisors need to effectively evaluate the opportunities on offer. Over 300 publicly traded funds provide exposure to U.S. high yield, but despite it's size and ubiquity, understanding of the asset class as a whole remains somewhat of a rarity—even among participants. A lack of transparency is partially to blame, but the market's evolution over the past fifteen years is the larger issue. High Yield Debt explains the modern high yield market in real terms, providing a much-needed resource for the savvy investor. 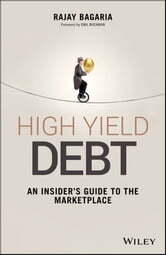 "Rajay Bagaria has written the first book that captures a 360 degree view of the high yield debt market. Whether you are an investor, investment banker, corporate lawyer, CFO or layperson simply trying to gain insights into the fundamentals of high yield debt, this book translates financial and legal concepts, trends and structures of high yield bonds and leveraged loans into a simple, understandable format. Mr. Bagaria’s book is a valuable resource for anyone involved in the new issue or secondary leveraged finance markets." "Bagaria does a great service for both high yield professionals and beginners by providing an accessible, well-written, insightful market primer." 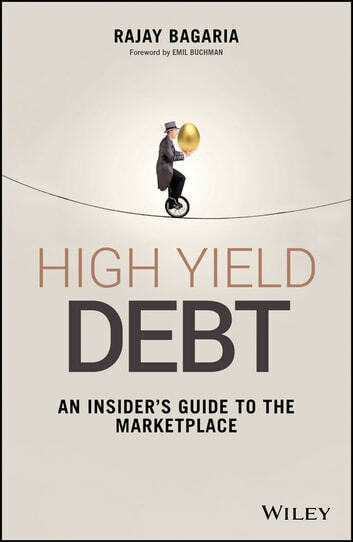 "High-Yield Debt - An Insider’s Guide to the Marketplace is a comprehensive book that provides an in-depth understanding of the history, growth, basics and details of high-debt and the high-yield market. The author gives insights that only an experienced professional can provide. The book will be invaluable to readers both starting out and knowledgeable about an important segment of corporate finance, dealing with concepts, structures and performance."